Mother originated in the nineteenth century on the farm of Gen. Stephen P. Gardner of Bolton, Massachusetts. It is well adapted to the South and was very well known in central North Carolina. 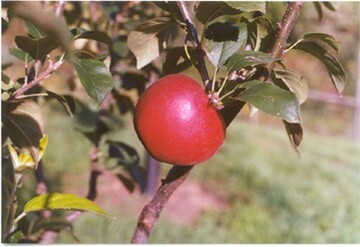 Medium size fruit is slightly oblong with thin, smooth, golden yellow skin mostly covered with red splashes and striping. Flesh is yellow, fine-grained, tender and juicy with a pleasant aroma. Ripens August to September in warmer areas, September to November in mountains.